Try to stay awake while you pilot that metal and glass death-trap, will you? School teachers might be unexpected beneficiaries of the latest driving-safety system developed by Toyota Japan - an automated camera that checks to see if we haven't accidentally nodded off by seeking out drooping eyelids. The Pre-crash Safety System anti-boredom device consists of a dashboard camera that measures the distance between top and bottom eyelids to spot when the driver's eyes seem to be closing. It's sophisticated enough to tell the difference between blinking and the repeated drooping that characterises the onset of sleep. 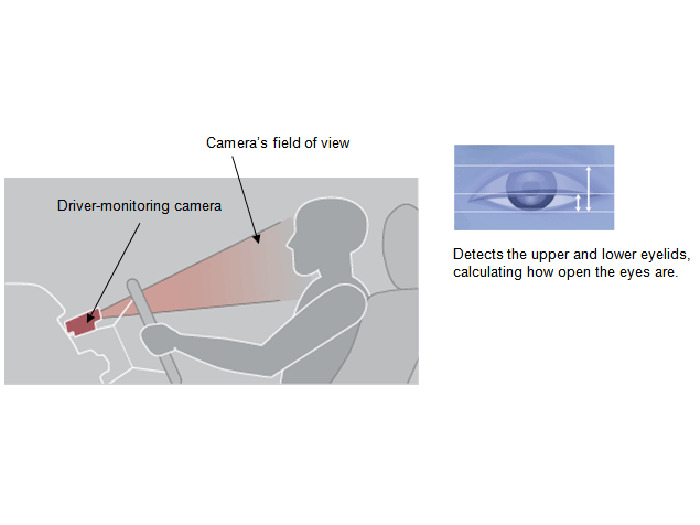 This combines with another Toyota technique for checking if the driver is actually facing forwards or not and a proximity radar that can sense nearby objects. If circumstances combine to suggest that a sleepy driver hasn't spotted another pedestrian, vehicle or something even harder and nastier, the car can issue a warning and apply a raft of safety measures like tightening seatbelts and applying the brakes. Toyota says it will fit the Pre-crash Safety System to various Japanese models in the near future, so we can expect to see it overseas too at some undetermined point.